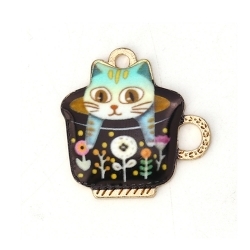 Enamel Charms There are 13 products. 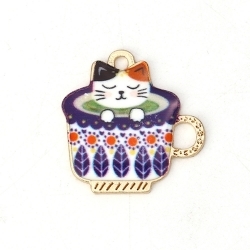 Pack of 5 really very nice enamelled cat charms, each one being approximately 2.3cm tall. Gold-coloured metal. Pack of 10 cute little enamelled cactus charms in 2 designs, each being 2.4-2.6cm tall including hanging loop.Silver-coloured metal. 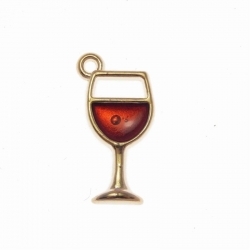 Pack of 12 cute little enamelled wine glass charms, each being 16mm tall plus hanging loop.Gold-coloured metal. Pack of 10 lovely quality cute enamelled white butterfly charms, each one being approximately 11mm wide. Gold-coloured metal. 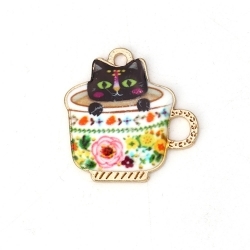 Pack of 10 lovely quality enamelled daisy charms, each one being approximately 12mm diameter. Gold-coloured metal.